Saturday, December 14, 1935, was “Anthony Wayne Day” in this Main Line town which bears the “mad” General’s name. With a parade, pageantry and patriotic mass meeting the citizens of Wayne on that day honored their own particular Revolutionary hero. More than 2000 marched in the parade along the Lancaster Highway, which began the day’s celebration. From the stand opposite the Wayne Library, the parade was reviewed by Major General Edward C. Shannon, 28th Division, Pennsylvania National Guard, and Colonel Clarence R. Day, Chief of Staff, 79th Division, U.S. Army. Afterwards, many of them joined other Radnor Township citizens at the mass meeting held in the High School Auditorium. Among the speakers at this meeting were the late W.W. Montgomery, Jr., of Radnor, who talked on the “Life and Times of Anthony Wayne”. A special musical program was provided by the Wayne Musical Coterie, the “Merriemen of Wayne”, and by Welsh singers in their native costume. The focal point of their festivities was the presentation to the Township by the “Wayne Committee for Civic Progress” of a set of eight highway signs, designed in the manner of the Colonial period. These signs were the work of Arthur Edrop, of the Wayne Art Center, and of Wayne Martin, of the Art Department of Radnor High School, with assistance from Herbert S. Henderson on the design and construction of the posts with their decorative Welsh dragons. The presentation was made by the late Rev. Crosswell McBee, the rector of Old St. David’s Church, with formal acceptance of the signs made by Joseph M. Fronefield, 3d, at that time president of the Radnor Township Board of Commissioners. Until a few years ago these signs, eight in number, had their places along Conestoga road as well as the Lancaster Highway. Two of them marked the confines of Ithan while two defined the Radnor Township limits, and four marked the towns of Wayne and St. Davids. After discussion at several of its own meetings, the Art Center members decided that they should bring the matter before a larger audience, at which a spokesman from their group would express their views. With the help of the local Chamber of Commerce, a meeting was called. Frederick Richardson, then president of the Wayne Art Center, was the main speaker. He addressed the meeting on the relationship between a well-planned and well-kept business section and a residential area such as Wayne. Looking into the future, the president of the art center said that he thought Wayne might well become “the most important town between Philadelphia and Lancaster” with its strategic location on the highway, its relation to Philadelphia and Valley Forge as well as its proximity to well known colleges and schools. He stressed the importance of building with thought for the future, emphasizing always the Colonial style of architecture. The audience which Mr. Richardson and Mrs. Bickley addressed showed great interest on many related subjects, such as playgrounds, a community house, and more adequate housing in less favored sections. As a result, it was decided to form a general committee with its members representing various civic and social organizations in Radnor Township. And thus the Wayne Committee on Civic Improvement came into existence. The organizational meeting of the “Joint Committee on Wayne Development”, as the group was first called, was held on Wednesday, November 1, 1933, in the Library of the Radnor High School. Fourteen members of this Joint Committee were present, including Arthur Edrop, from the Wayne Art Center, who called the meeting to order. Others were Miss Mary L. Walsh, Charles A. McClure and Clarence J. Tolan, from the Art Center; Miss Velma Turner, the Neighborhood League; Miss Susan Dorothea Keeney, Mrs. Duffield Ashmead and Mrs. Charles W. Bayliss, the Garden Club; Mrs. Lilian B. Aman, the American Legion Auxiliary; Mrs. T. Magill Patterson, the Saturday Club; Charles H. Shepler, the Wayne Public Safety Association, and Dr. Seneca Egbert, C. Lawrence Warwick and Harlow H. Loomis, from the North Wayne Protective Association. Nominations for permanent officers for the newly formed Wayne Civic Improvement Committee, as this organization was henceforth known, resulted in the election of Mr. Edrop as chairman and of Mrs. Patterson as secretary and treasurer. The objects of the Committee were summed up as follows: “To make Wayne as attractive a community to shop in as to live in… architecturally in harmony with its Colonial and Revolutionary tradition… to plan for its further development with a proper regard for beauty, dignity, economy, and efficiency in all those things affecting its many sided activities… to build for the future rather than for the immediate present”. Sites from Louella House looking east: barns, stables, later Merryvale Athletic Assoc. Last week’s column described what J. Henry Askin, founder of Wayne in the middle 1860’s, saw to the south of his handsome mansion, “Louella House,” as he looked up the hill along the line of what has now become Louella avenue. Beautiful as that hillside view was, it was not comprised of his own properties. However, as Mr. Askin looked to the east, the land on the north side of the old Lancaster Pike was his as far as the eye could reach. The eastern boundary of his holdings was marked by the small cottage shown in the first picture of this week’s column. The spot on which it stood is about where the ninth hole of the Main Line Golf Club course is now located. 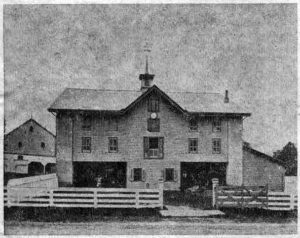 The first buildings that Mr. Askin saw eastwardly along the line of the Pike were the main barn, the granary, the stables for the “pleasure horses” and the coach house. These are shown in the second picture. The neat main buildings, topped by its cupola and its weathervane, stood very close to the Pike, the narrow road shown in the picture just this side of the whitewashed fences. Several old fashioned equipages are plainly discernable in the doorways and and in front of the gate, with a coachman standing beside the one on the left. 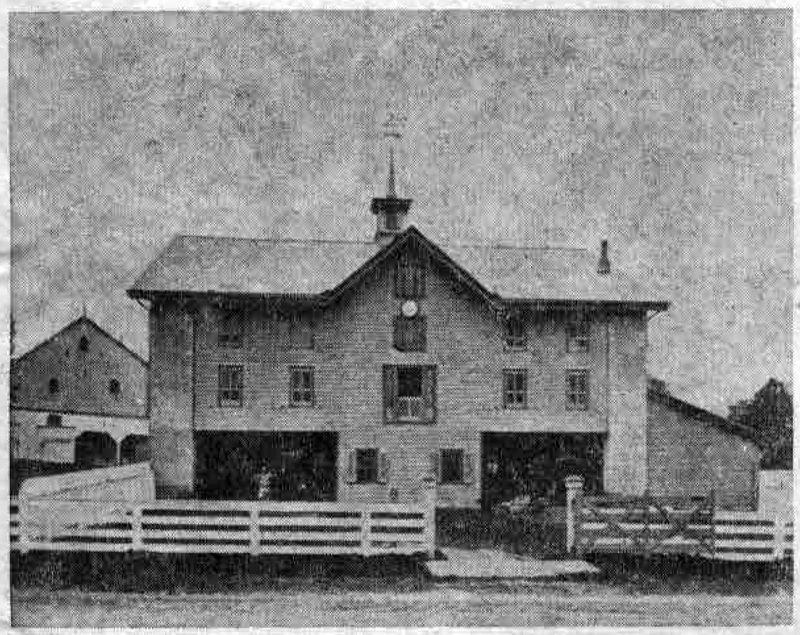 The farm clock is in the immediate center of the coach house. This coach house later became the Siter and Barrett Livery Stables. At present, this is the approximate site of the Kromer warehouses and the Lewis Upholstery Shop. The late Joseph M. Fronefield, Jr., in some notes on early Wayne, says of the old building, “it can be credited with the birth of Radnor Library (afterwards known as the George W. Childs Library and the Merryvale Athletic Association, afterwards changed to the Radnor Cricket Club.” And not least among Wayne Hall’s distinctions is the fact that the “Wayne Times” was at one time printed here! Some recall that elections were held here, and still others remember that Fourth of July celebrations took place on the grounds. The small house shown in the first picture in this week’s column was one of the Askin farm houses, located, as we have previously stated, on the present Main Line Golf Club course. Later in its career it was moved to the northwest corner of what is now Chamounix road and Lancaster Pike, where some of the old time residents still remember it as one of the Pike’s numerous toll houses. 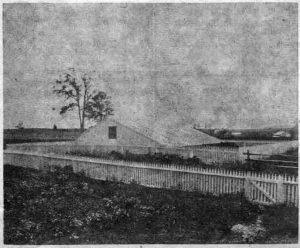 Originally the only building between Wayne Hall and this small farmhouse, as it stood on its first location, was the parsonage of the old Presbyterian Chapel, known as “The Manse.” This is shown in the fourth picture of our series. 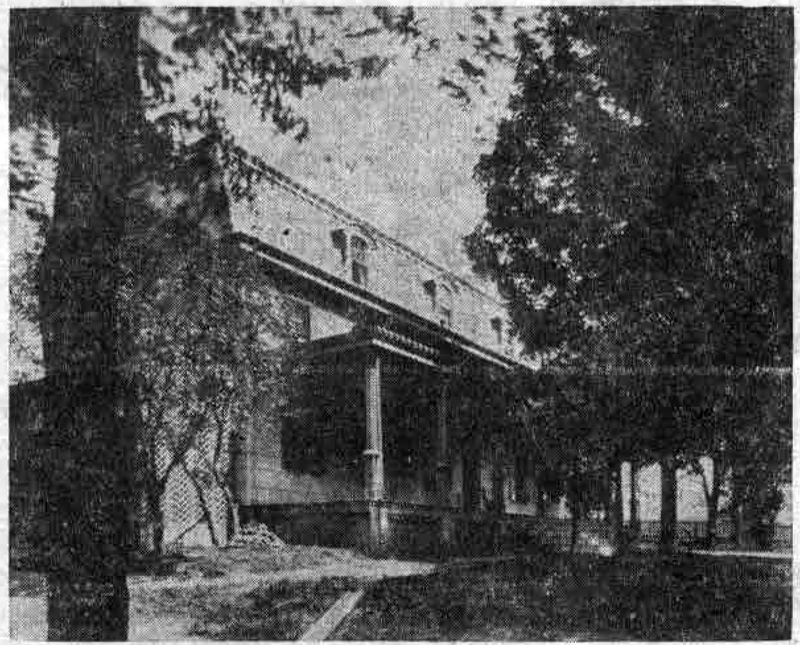 The fifth picture shows the house after it was remodeled by John H. Lofland, in 1906. The latter bought it from Samuel S. Ellis in 1889. In the 17 years between 1889 and 1906, Mr. and Mrs. Lofland and their two young daughters used it as their year-round home until about 1919, when they sold it to Mr. and Mrs. Frederick Richardson. It is now the property of Walter B. Lister, managing editor of the Evening Bulletin. It still looks very much as it did after Mr. Lofland remodeled it. 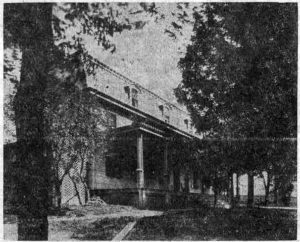 Mrs. Florence Lofland Williams, one of the Lofland daughters, who now lives with her sister, Mrs. Daniel M. Sheaffer, on Audubon avenue, recalls that the remodelling of the old Presbyterian Manse was so extensive that it required about a year to accomplish. The entire inside portion was removed, with the second arrangement of rooms an entirely different one from the original. A large addition was also put on the back, and, as the second picture shows the roof line was changed. With its extensive and beautifully planted ground, this was, indeed, a gracious home for Mr. Lofland and his family. In recalling the house as it was then, Mrs. Williams remembers especially two wells on the place, one near the house, which furnished all the water for household use, and the other near the Pike. Many stopped at the latter for a drink of the cool well water, including numerous bicyclists who frequented the Pike. Although in the very early days there were no buildings between the stables and Wayne Hall, Mrs. Williams recalls that later “the ten bricks” were built there. These were five two-family brick houses, which are still standing. In closing this series of three articles and pictures of the Askin estate and other properties in the immediate vicinity of Louella Mansion, your columnist wishes to thank Herman Lengel and the Radnor Historical Society for the use of the well-preserved volume of pictures, copies of which have illustrated these articles. She also desires to thank Henry Slaw and Mrs. Williams, as well as Mr. Lengel, for the information they have given her. Mrs. Williams calls attention to the fact that the Frank Smith mentioned in the first article was not the Mr. Smith of the firm Wendell and Smith, as erroneously stated. Frank Smith was originally private secretary to George W. Childs who, with Anthony J. Drexel, founded the Wayne Estate. He later became the manager of this building operation for Drexel and Childs. As Mr. Askin stood on the large front porch of his beautiful home, “Louella House”, of which we showed pictures in this column last week, he could look up the hill to the south and see the wide-spreading acres of the Siter, the Fritz and the Mifflin farms. 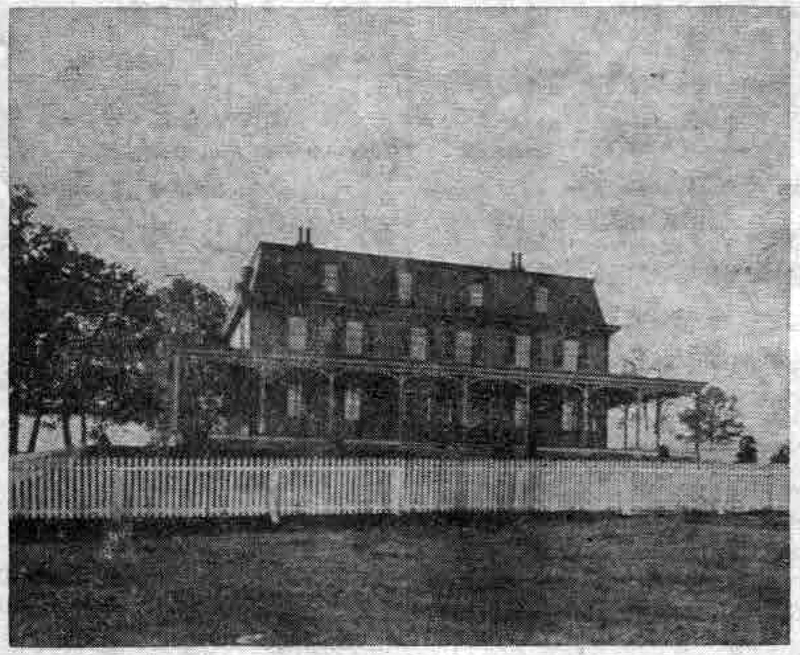 The Mifflin farm faced on Conestoga road, with its main buildings located about where the Donald C. Mills family now lives on Upland Way. The farm had an entrance lane from Lancaster Pike which left the Pike at the site of the big tree where St. Mary’s Church now stands. Mrs. William H. Badger’s house on Windermere avenue was built directly on this old lane, which was lined on either side by some of the magnificent trees still on Mrs. Badger’s lawn. 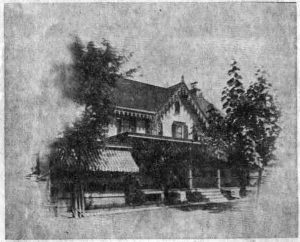 Our first picture in this week’s column shows a large double frame house which, in Mr. Askin’s time, stood about where Mrs. John H. Stone’s home is located at the southeast corner of Louella avenue and Upland Way. 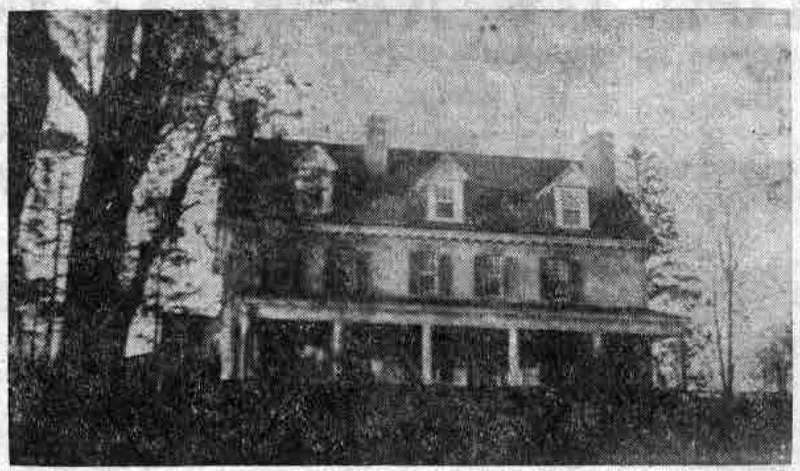 While the picture is included in the large book of handsome photographs of “Louella House”, given to the Radnor Historical Society by Heman P. Lengel, ownership of the house is not on record. It seems likely it was part of the Mifflin holdings. 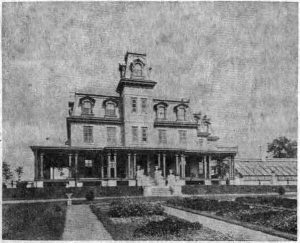 The interesting part of this house, with its mansard roof and its neat, white picket fence, is that some years after this picture was taken, it was lifted from its foundations and placed on rollers to be moved to the Bellevue Hotel, the fashionable summer hostelry which was located on the site of the Helen Kellogg dining room. Joined to the hotel, it was to serve as additional kitchen quarters. Apparently all went well with this moving job, until the movers reached a point on South Wayne avenue, about where Mrs. Robert P. Elmer’s house now stands. It may have been caused by the momentum gained on the down grade on Windermere avenue just before it reached this point, but at any rate, the big farm house completely collapsed there. And the Bellevue Hotel did not have the additional kitchen space on which it had counted! The site on Louella avenue made vacant by his moving, is approximately that of Mrs. Stone’s home. This house was originally occupied by the father of the late Mr. Louis Watt, who was president of the Wayne Title & Trust Company. John H. Stone bought this house from Mr. Watt. 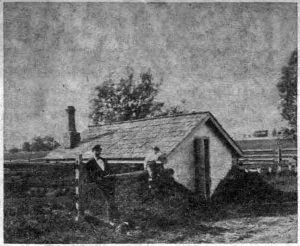 The third picture shows the pump house located, according to the picture caption, “on Midland avenue, near the Willow trees”. This contained the wheel and the pump to force water into the Mansion house and its surrounding buildings. The man in the picture is identified as David H. Lane. Now, 80 years after it was taken, it would be interesting to identify also the small boy with his round brimmed hat, his tight, below-the-knees trousers, and his high buttoned shoes. In connection with the pictures of the reservoir and the pump house, Harry W. Slaw, of Pennsylvania avenue, tells your columnist that his father, the late Mr. Benjamin F. Slaw, of Newcastle, Del., was the first engineer of the Water Works System in Radnor Township. 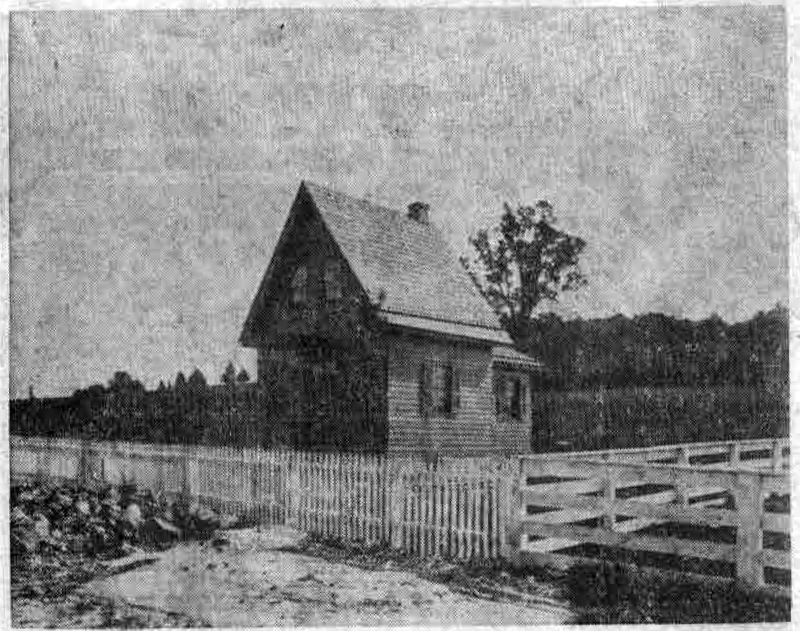 The second pump house to be built after the one shown in the picture was also located on Midland avenue, near its western end. This was a good sized brick building, with a stack. It was through Isaac F. Cassin, who built this, that Mr. Slaw, a friend of his, obtained his position as engineer. A later reservoir was located on Bloomingdale avenue, about where Mr. Thomas C. Chalfont now lives. Later, the reservoir used until the Springfield Water Company came into operation, was built on Radnor road, opposite the Valley Forge Military Academy. The fourth picture Mr. Slaw did not recognize at first. Then on closer scrutiny he exclaimed, “Why, I could put my foot on that identical spot on Vance Hale’s backyard… I recognize it by the rock!” When the picture was taken, it was the famous drinking spring in the meadow just south of the Pike, opposite Louella Mansion. The big rock was known as “Frog Rock”. In the background of the picture is the big frame house on the hill shown in our first pictures, while to the right is a glimpse of the white, covered reservoir. The great expanse of ground that was then cornfields is now occupied by the Wayne Schools and by Windermere Court. Among the first gifts to be presented to the Radnor Historical Society when it was founded several years ago, is a priceless book of old photographs of “Louella, Home of J. Henry Askin, Wayne Station, Pennsylvania Railroad”. The pictures include “Views of Mansion, Farm Houses, Surrounding Scenery, etc.” These pictures were taken about 1872 by F. Gutekunst, of 712 Arch Street, Philadelphia, well-known photographer of his day. Three of these books of photographs were ordered by Mr. Askin, whose name has come down through the years as the founder of Wayne. One remained in the possession of the Askin family with one of the Askin daughters as its custodian. The latter died in Media only a few years ago. Another was placed in the possession of the John L. Mather family. The third was given by Mr. Askin to Frank Smith, of the old real estate firm of Wendell and Smith. [This was later corrected by Mrs Patterson in her 10-24-1952 article to confirm this was a different Frank Smith, not of Wendell & Smith. She points out that the correct Frank Smith was originally private secretary to George W. Childs who, with Anthony J. Drexel, founded the Wayne Estate. He later became the manager of this building operation for Drexel and Childs.] He, in turn, presented it to Herman P. Lengel. And through the generosity of Mr. Lengel, this book of photographs has become the possession of the Radnor Historical Society. “Louella” was the second name to be given to Wayne, the first being Cleaver’s Landing, so called because trains of the Old Lancaster and Columbia Railroad stopped just west of the present Wayne station to pick up milk, to be shipped to Philadelphia from the Cleaver farm. The name “Louella” is a combination of “Louise” and “Ella” as Mr. Askin’s two daughters were called. Though Louella later became Wayne, the former name still lives on in the community, “The Louella Apartments”, and “Louella Avenue”. Our first picture shows one of the two Askin daughters mounted on “Billy Button”. Whether Billy’s owner and rider was Louise or Ella Askin is not recorded, but charming, indeed, is this rider with her small front-tilted hat and her riding habit with its graceful, full skirt. In the background of this picture of “Billy Button” and Miss Askin are the Askin Cottage and the Summer house. The former is shown in more detail in our second picture. Presumably the gentleman on the porch is Mr. Askin himself. The cottage, which was occupied by the Askin family during the period when the more pretentious Louella Mansion was under construction, stood well to the northeast of the latter, with its back to the railroad. The small summer house was located between the Cottage and the Mansion. The third picture shows the front of the original Louella Mansion, which forms the nucleus of one of Wayne’s landmarks, now the Louella Apartments. This faced on Lancaster Pike at the 13-mile stone. This main building, as well as the surrounding improvements were laid out and completed in 1866-67, the time occupied in erection being one year, less two days. The two wings, one to the east and the other to the west, were added later, the former taking the place of the greenhouse shown in this picture. With its mansard roof and its tower commanding a far flung view over what were then farmlands in all directions, it was an imposing building of its period. To the present day onlooker the picture has a singularly bare look, since in the years succeeding the building of the Mansion, great trees have grown up on all sides of it. What was then the long central flower garden is now the pathway flanked with trees that leads from the apartment house to the right and left of this walk. Louella Drive with these shade trees is somehow reminiscent of the more gracious living of a century now past. 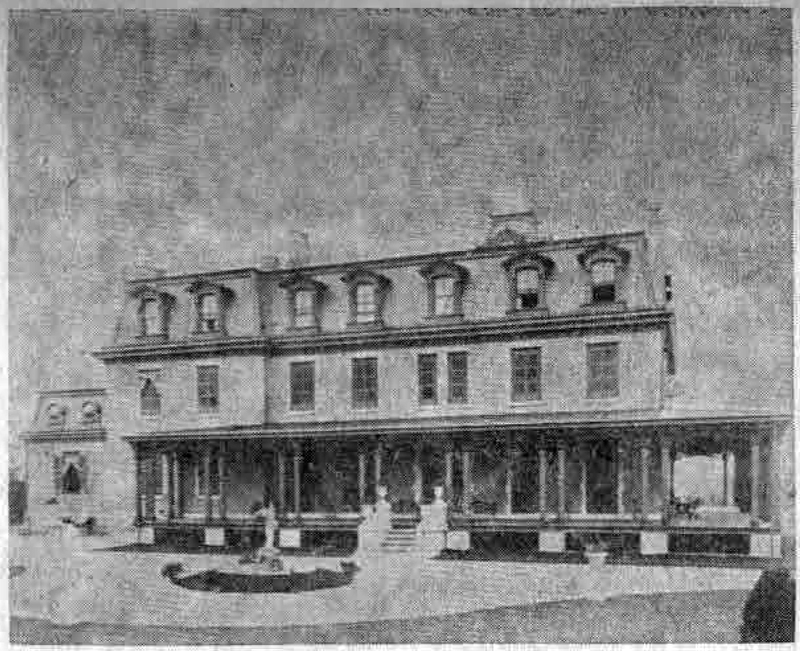 The fourth picture shows Louella Mansion as it looked from the railroad side, with its long French windows opening onto the wide porch in front of the mansion. In the far background the ploughed fields across the Pike are discernable. The large iron dog to the right of the porch is still one of Wayne’s landmarks. Known as “Caesar”, it was given at a somewhat later date to Mr. and Mrs. Wiliam D. Hughs, when they lived with their young family on what was later known as the William Wood property on Lancaster Pike, west of North Wayne avenue. 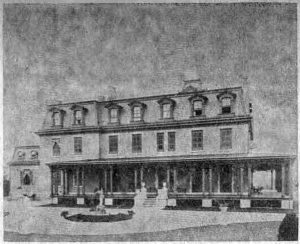 Within the past few years “Caesar” has been transferred to the grounds of the old Dr. George Miles Wells property, north of Wayne railroad station, now a small apartment house where the Hughs daughters, Mrs. William A. Scott, Mrs. Frederick J. Higgins and Mrs. Malcolm Sausser live. He is still an object of much interest to all passers-by, including any real dogs, who actually bark at him. 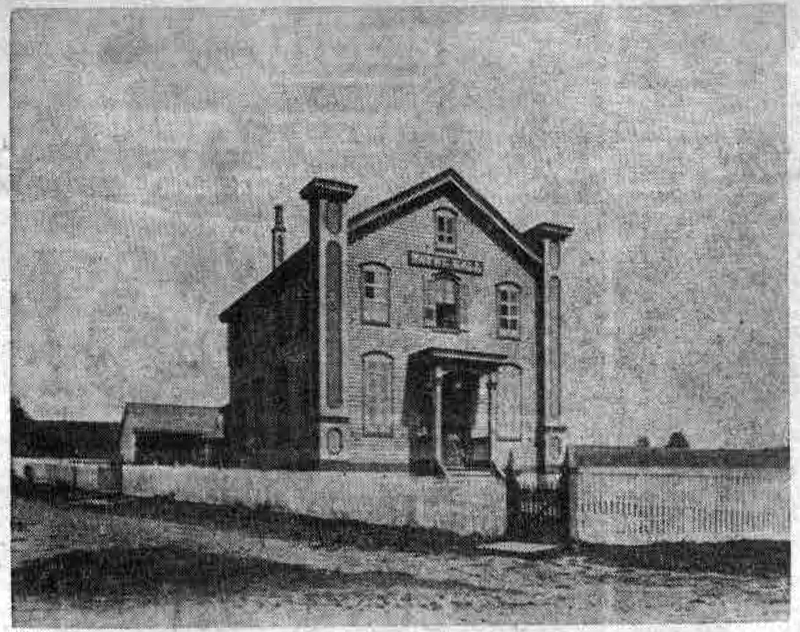 Of the three early residents of this section whose reminiscences of their school days at the Old Eagle School in Strafford have been made available to us through clippings from the January, 1900, issues of “The Suburban”, all were born in the first quarter of the 19th century. The youngest of these was Joseph Fisher Mullen, living in Upper Merion Township at the time he wrote of his early life. He was then 76 years old, having been born in Downingtown on March 31, 1824. He was only a year old when he came to “the hill adjoining the Eagle School”. And here he lived for 59 years, not leaving that section until 1883. In true, small-boy fashion, Joseph Mullen was always curious about “a hole like a cup” in one of the outside stones at the northeast corner of the school building. It looked to him as if it had been made by a cannon ball. “But”, as he added, “I never knew what it was.” Although he had known little about the old log Lutheran Church, which supposedly once stood at the side of the school, he could readily believe that the great logs, used as joists in the Huzzard house, had originally come from the early church. Joseph Mullen’s mother had been Elizabeth Huzzard before she married John Mullen. 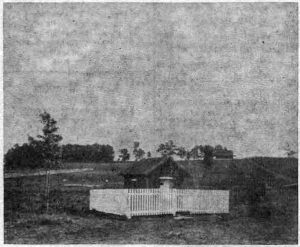 The Huzzard house stood on Eagle road near the school. From his grandmother, Roseanna Augee, who married Jacob Huzzard, small Joseph heard that the ground on the west side of Old Eagle School road, opposite the school itself, had been given by one Nancy George for “a church free to all except Catholics and Baptists”. This church was never built, however, and all that Joseph Mullen remembered of the property was that in his youthful days there were the ruins of the cellar of an old house on it. Adam Siter was one school master who seemed to make a great impression on all three of these writers of school day reminiscences, perhaps because he took care of his duties so well, in spite of his partially paralyzed condition. “Father paid him three cents per day for our schooling, each, and we found our books, etc.,” Mr. Mullen writes. Among these books were Pike’s Arithmetic and Comley’s Spelling, and for later use “The American Tutor”. In arithmetic, when I was a boy, we did not study in classes; some studied in one book and others in a different one,” Mr. Mullen remembers. Like the other two pupils of whom we have written, Joseph Mullen’s recollections were particularly vivid in the matter of school discipline. He speaks in sincere admiration of one David Rogers, who taught at the Carr School and who “kept splendid order.” This “Master”, as all teachers of that time were called, “had two straps called ‘Constable’ and ‘Sheriff’. When a boy behaved badly he threw the ‘Constable’ at him, and the boy had to bring it up, and then he warned him, and perhaps struck him once. If he repeated the offense, then he threw the ‘Sheriff’ at him and when the boy brought it up, made him give security through another boy that he would behave himself. If he failed to do so, then both he and his security were soundly thrashed”. We might add that, perhaps any master who thought out his disciplinary methods as carefully as did Mr Rogers, deserved the admiration one of his pupils gave him! Among other occasions that were vivid in the memory of the 70 year old Joseph Mullen was when Adam Siter took all the school children to see Maul’s bridge, which was then being built “above the present St. Davids Station and was a great curiosity because it was so high. The old culvert and bank near Newhall’s, at Strafford, was constructed by use of wheelbarrows entirely”. 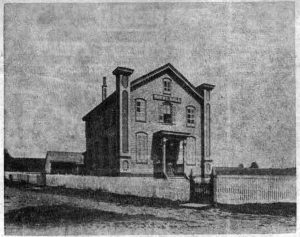 The military parading in corps around the schoolhouse and the firing of cannon under the direction of Captain John Yocum also left their vivid imprint on a young schoolboy’s mind. 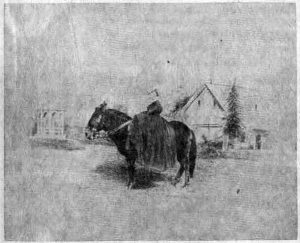 Like Miss Cornog and Mr. Worrall, Joseph Mullen recalls with much interest those first horse-drawn cars on the old Philadelphia and Columbia Railroad. “I remember,” he writes, “ that Matthew Ferguson, an Irishman on Pechin’s place, outran the first engine with a blind horse. He used to boast of it. Mr. Mullen remembers that when the first engine appeared, the roads were lined with people to see it. The great changes made, not only by the railroad, but by the telegraph as well, met with much opposition. He quotes some of the older people as saying, “It was bad enough when the railroad came, but now with telegraph, no poor man could keep a cow.” It is a little difficult to follow the thought here. However, it is plain that neither the railroad nor the telegraph were popular in this locality, when they made their appearance in the early half of the 19th century.